The picture shows two men seated on a bench. One of them is fishing in the river. The background of the picture shows a bridge and more fishermen. This water colour by Claude Buckle is from a greetings card printed by a Royle's. The signature is missing so the picture is bigger than that shown on the card. The river is mostly shown in shadow and unlike other water scenes the attention is given to the two men seated on the bench rather than the water itself. 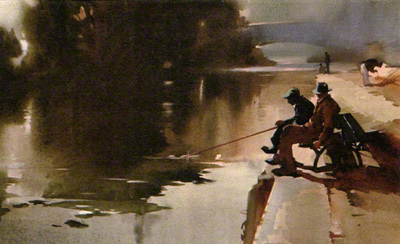 Notice how the shaded part on the left balances the main theme of the picture of the two men fishing. Notice also the almost perfect perspective and vanishing lines. To my knowledge Claude Buckle never painted a picture with distorted perspective. This is a likely outcome and a skill he acquired by long years as a commercial artist. Created in 1968.